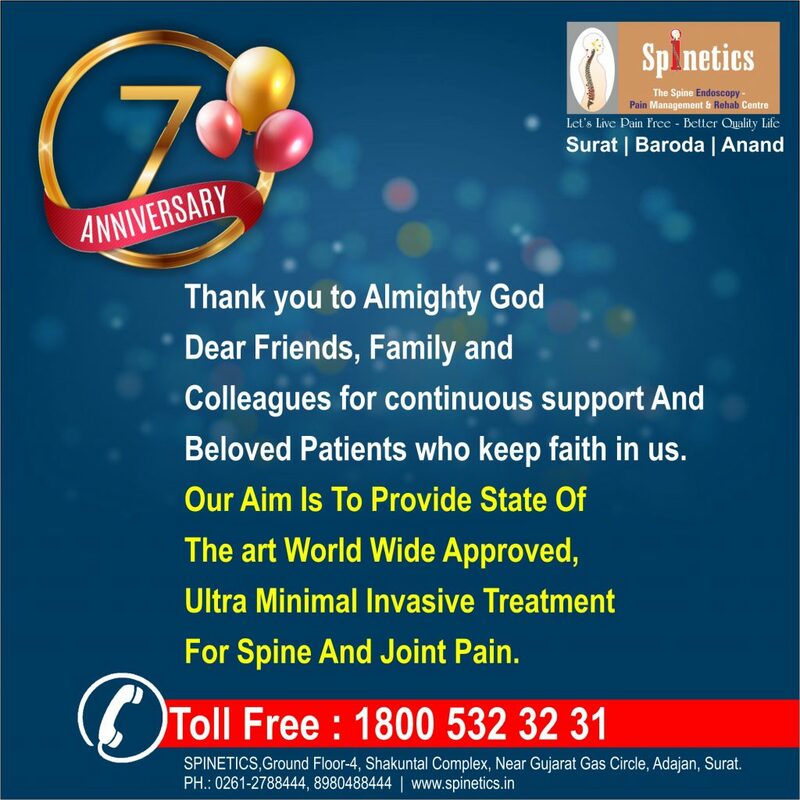 Spinetics is proudly celebrating 7 years anniversary of caring and treating our patients with a unique integrative approach. We pride ourselves in giving hands on treatments and provide you with easy to follow exercises in order to promote better healing. We are grateful to God, family, friends, and colleagues for continued support and beloved patients who keep faith in us. 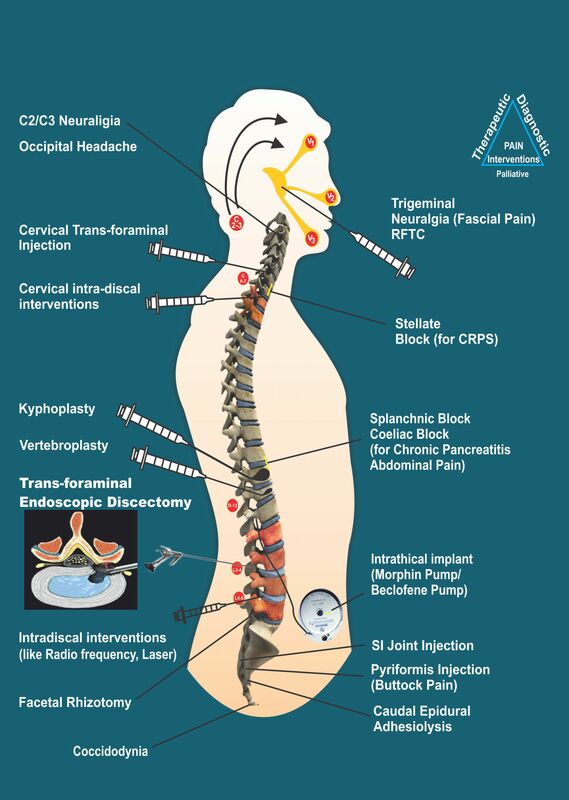 Our aim is to provide state-of-art, and ultra minimal invasive treatments for spine and joint pain. With an integral approach, we help patients to experience a better quality life and often see measurable improvements in their overall wellness. We work closely with our patients to tailor treatments to their individual needs and use techniques that will best suit them. We again re-assure and pledge that Spinetics will come up with better personalized care and services in the coming years. At spinetics, we understand that no two people are the same and that your story is unique and different. We examine the whole body regardless of the diagnosis. We treat each patient as a distinct individual with unique needs. Highly qualified and experienced therapist provides best treatment to facilitate rapid control of your pain and return to activity. He will create a plan specifically designed to help you achieve your personal goals and will be assisting you every step of the way. We use the most advances and high-quality technologies which have been trialed and tested by the scientific studies. We make no compromise on the quality of our assessment and technologies to give our patients the best care. We Help You Get Back To Full Health ! મારા ઘુંટણમાં ખૂબ જ તકલીફ થતી હતી જેથી મેં ડૉ જેસ્વાલ પાસે ઘુંટણનું ઓપરેશન કરાવ્યુ.ઓપરેશન પછી કોઈ પણ પ્રકારનો દુખાવો થતો નથી. ઓપરેશન પહેલા અને પછી શિરોયા સ્પાયનેટીક્સ હોસ્પિટલ અને તેનો સ્ટાફ તેમજ ડૉ. જેસ્વાલ સાહેબે મારી ખુબ જ કાળજી લીધી છે. તે બદલ સ્ટાફ અને ડોક્ટર બંનેને મારા ખૂબ ખૂબ ધન્યવાદ. મને મહિના પહેલા પડી જવાથી ગોઠણ ખૂબ જ દુખતો હતો. ડૉ. જેસ્વાલ ને બતાવ્યા પછી ખબર પડી કે લિગામેન્ટ ના તૂટી જવાથી આમ થાય છે, જેની સર્જરી કરવી પડે તેમ છે. તેથી મે લિગામેન્ટનું ઓપરેશન કરાવેલ છે. ઓપરેશન પછી મને ખૂબ સારું છે. અહીં હોસ્પિટલમાં મને કોઈ તકલીફ નહોતી પડી. અહીનું મેનેજમેન્ટ અને સફાઈ મને ખૂબ ગમી. ડૉ. જેસ્વાલની મદદથી મને આજે ગોઠણમાં સારું છે અને સારી રીતે ચાલી, દોડી શકું છું. I am Manan D. Kapadia from Surat. I am working as a Sr.Project Manager in Rajhans Infracon (I) Pvt Ltd. During the site inspection, I got fallen down from 5-6 foot Height. My ACL Ligament got raptures badly due to all weight came on my right knee by force. It was horribly painful. I was unable to walk even & all my daily routine was messed up due to this accident. I got the reference of Shiroya Hospital and Dr. Arvind Shiroya has given me perfect advice to go under the surgery. “Surgery” word makes people worried about their future and if it came at the age of 29 then it needs to think twice.But Dr. Arvind Shiroya has given me confidence and made my surgery successful. Now, I can easily do all my routine activities without any hurdle. My life it back on track. I really want to thank Dr. Arvind Shiroya & all hospital staff for the delightful service I got during & after my hospitalization.